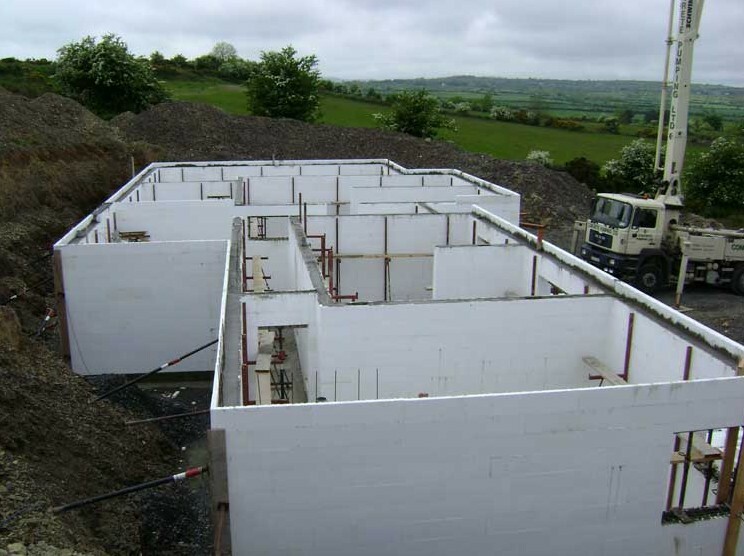 Linton DMC highly recommend using Rhodipor Ecobuild to build your properties basements, not just for the inexpensive costs to run. The efficiency of the thermal mass, ensure your basement will feel warm in the winter and cool in the summer. Your families home or commercial building will have the added space available for expanding without the cost of adding more structure. 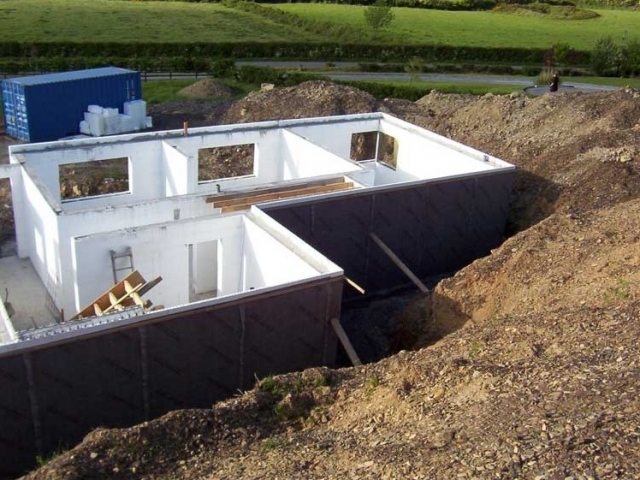 Project Description: two-storey new build Rhodipor Ecobuild ICF home constructed into a hill with an ICF basement and ground floor. ICF delivery route: full build. Foundations: raft on a ring beam. 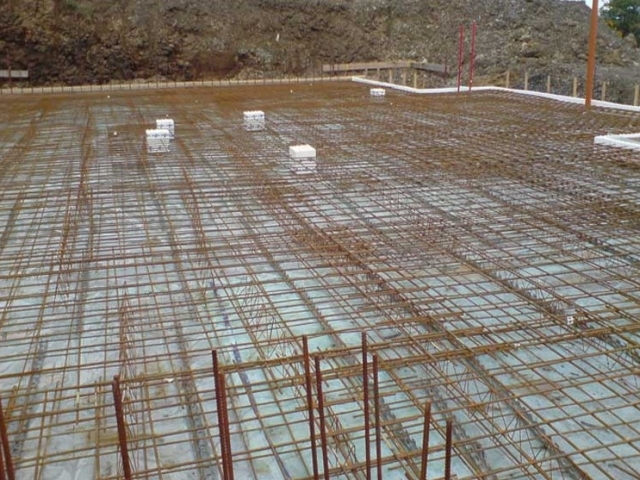 Floors: solid concrete ground floor, precast concrete planks to the first floor. 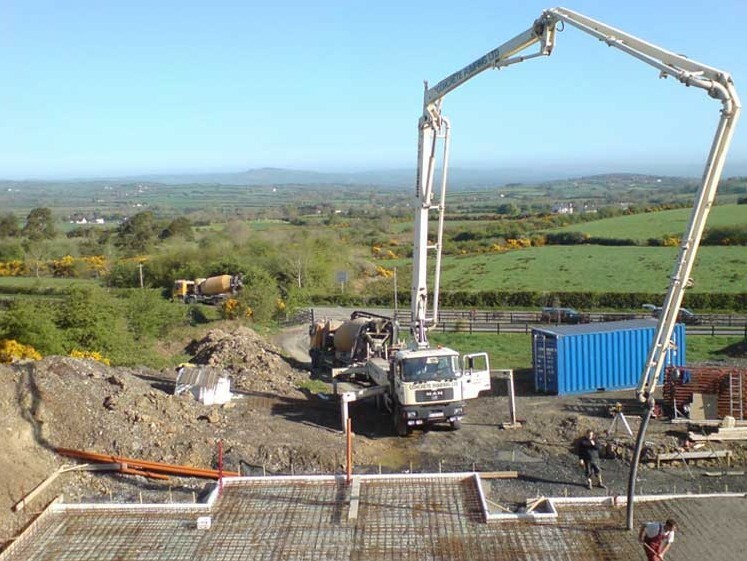 Walls: 300mm above ground and 350mm below. Roof: traditional cut rafters and purlins to form a vaulted ceiling. 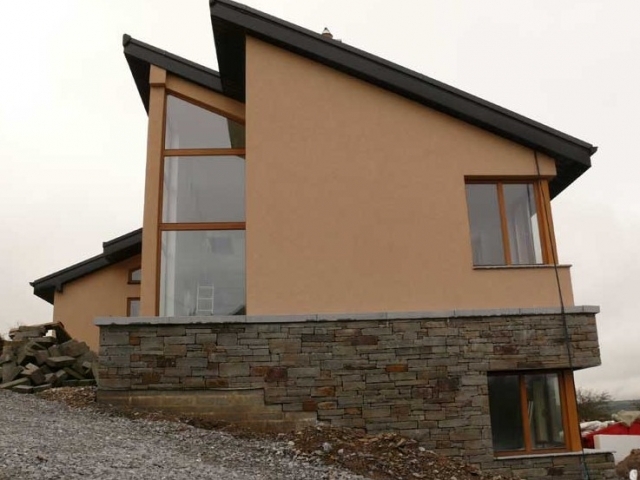 Constructed into the side of a hill this stunning new build ICF home flips the locations of modern living accommodation. 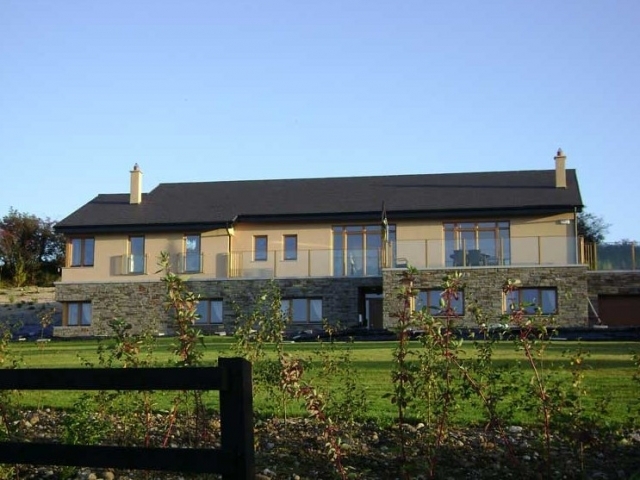 In the basement, the accommodation hosts the bedrooms with the upper-level panoramic views of the adjacent valleys from the living accommodation. Working to architect’s drawings and engineering information a full construction service was provided by our local partners. To deliver a challenging building we advise clients that the better the quality of technical information the more robust a quote can be produced. This is true of the construction process and believes it to be false economy not to invest in this part of the process. Please see our other pages for engaging with consultants and what information to expect. To construct the ICF basement walls the foundation was formed with a low-level ring beam and interconnecting structural concrete raft over. 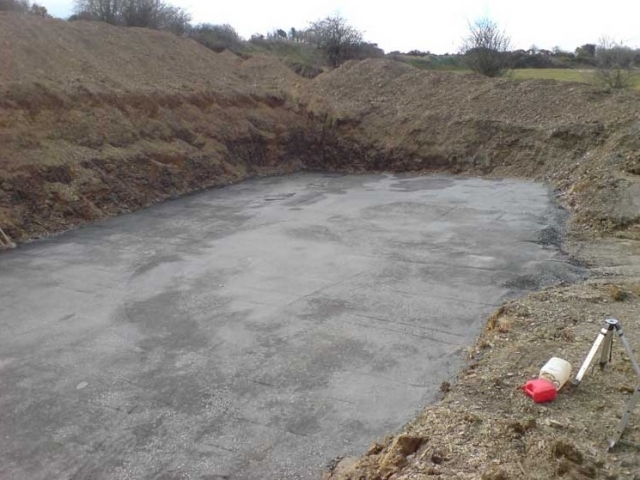 At retaining locations reinforcing bars extend upwards unifying the ICF and the foundations together. 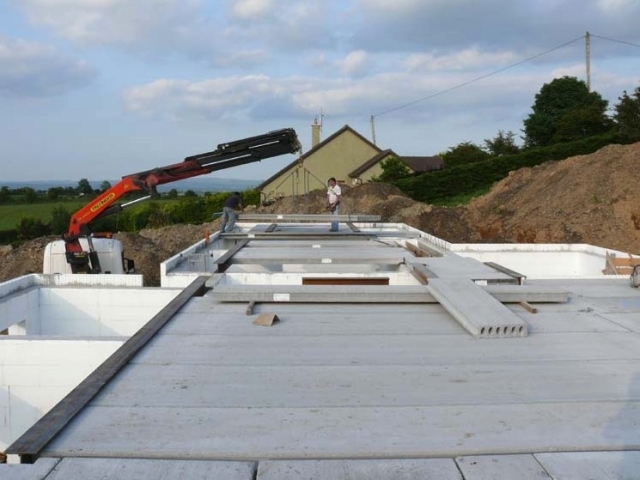 At first-floor level, precast concrete planks are installed.When undertaking new build homes, we believe that concrete floors like precast planks or beam and block work best. High-density materials such as concrete work as a mass heat store when in conjunction with underfloor heating. The underfloor heating will always be constantly running through the energy draw from this will be significantly lower than the initial use. 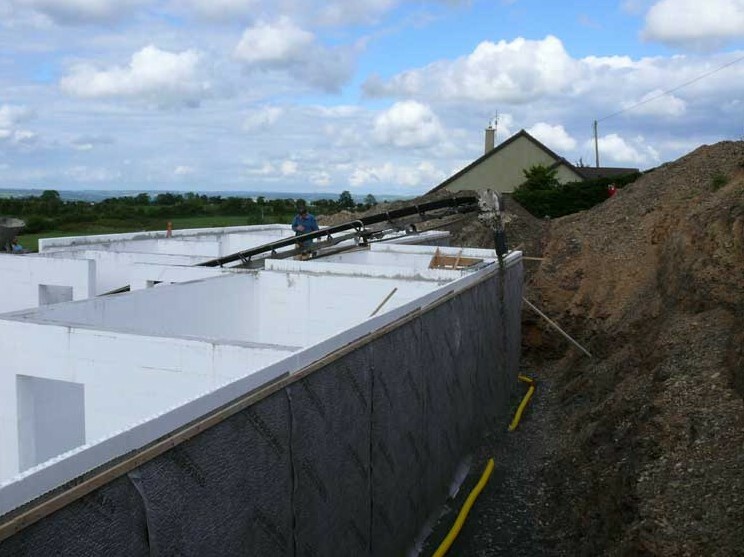 Walls that are retaining are 350mm wide, and those were not are 300mm wide and it is the links that join the ICF panels that are adjusted. Where the Rhodipor Ecobuild wall panel is exposed this has been finished with render applied directly to the surface. 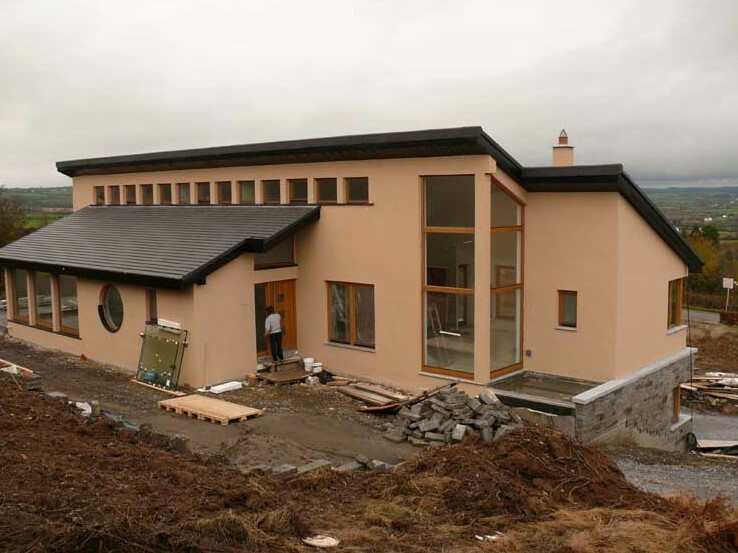 When the stone has been applied a formal wall with 50mm cavity on the outer skin has been constructed. 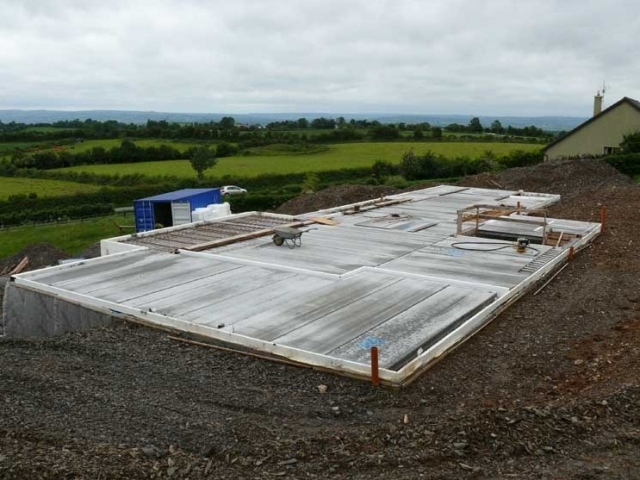 This is tied back to the concrete core of the ICF. Locations where walls are underground these need to be 'Tanked.' Tanking is the process of applying a waterproof covering to prohibit the ingress of water. Ensuring that this is done correctly we recommend that specialist contractor undertake the works whom will provide an instance backed warranty. The roof is constructed with traditional cut rafters and purlins to form a vaulted ceiling. Insulation is added between and under the rafters. The finished roof is complimented with a riven textured slate. The texture aids in breaking the flat surface whilst still having a sleek appearance.